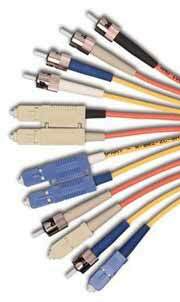 The Graybar Storefront of The Siemon Companying fiber links, choose from simplex or duplex, multimode (62.5/125 or 50/125) or singlemode, SC or ST, jumpers or pigtails. Assemblies are available in standard lengths of 1, 3, and 5 meters and custom lengths are also available. Each terminated connector is optically tested for the assurance that 100% of company-built cable assemblies meet the stringent performance limits as noted in the chart below.